The April dinner meeting in Lima is at Western Sizzlin Steakhouse, located across from the Lima Mall - West End just past the 3rd stop light if you are coming from the east counting the light at the main corner of Cable and (309) Elida Roads. For more information contact: Dave Benny (419) 331-5388 or Bob Torbet (419) 227-3305. Let's take this opportunity to welcome guests to the many possibilities of our club. This is just an example of wht we should expect as far as turnout for the annual Ohio Jamboree. 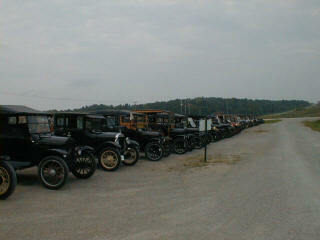 Cars show up from all over Ohio and the neighboring states. All that we need to do is provide something for them to do and they will make the best of any situation. As you can see in the pictures, this was an overcast day and everyone was having a great time. 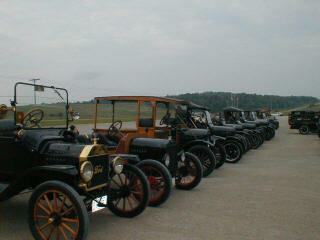 To the left is a 1909 touring car that was brought west from Vermont. The ouside firewall and windshield show that the car was toured quite extensively in the 1950's. There's a lot of paperwork about the history of this car. Notice how short the steering wheel is compared to those in later years. The color is a deep maroon. 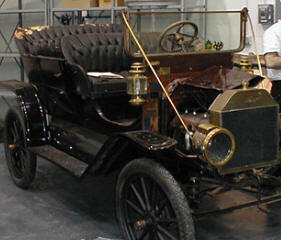 The picture to the right is the firewall of the 1909 Model T touring car. I believe that that is a clock above the steering wheel. Another point to note is that the firewall is in two pieces. 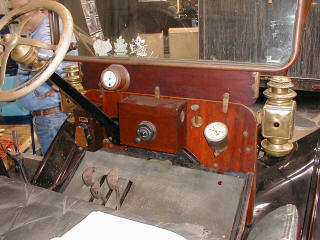 One piece contains all of the normal T items (coil box, carburetor adjustment, and speedometer). The other board seems to be a part of the widshield. The guys that know these things believe that the floor mat is original because it doesn't have a Ford logo on it. 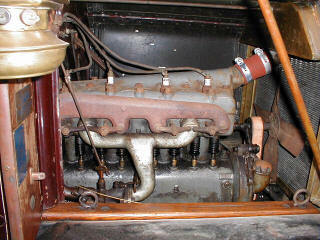 To the left is the engine compartment of the 1909. The valves are open, the engine number is on the block just behind the oil filler cap, the intake casting is goose necked, and the engine pan is one solid piece of steel. There isn't any inspection plate. The engine pan looks almost like it was beat into shape with a sledge hammer. The drive shaft demonstration was prompted by 2 of the members of the club tearing down their drive shafts and rear axles at the same time. This seemed the appropriate time for such an event. Bob Torbet's drive shaft was already out of the car and waiting to be welded. Mine was sitting in the corner waiting to press on the drive shaft sleeve. It was the most likely candidate. Anyone who hasn't looked inside the backend of their T should take a look for theire own safety and piece of mind. The following section will have a detailed list of the steps involved in removing the drive shaft and all of its components. It is important to clean everthing in the assembly in order to get good readings on all of the parts. Several of the parts must be replaced by their very nature. The drive shaft housing front bushing is one. It was originally made out of babbit and is prone to leaking oil back the drive shaft and back into the differential. Another part that will not survive the rebuild is the universal joint knuckle pin. The original pin was peened on both ends. The fit will be destroyed as soon as the pin is driven out to release the universal joint casting. Some of the steps seem straight forward; but, allow at least two days to do this job correctly. Remember to get everything as tight as possible and still be able to move. Everything will free up as soon as the car is driven. Remove the 4 bolts from the universal and the 6 bolts from the roller bearing housing. Remove the parking brake rod support brackets from the rear radius rods. Remove rear parking brake clevis from the brake cam levers. oil that has drained down the housing. Take out the top and bottom universal housing plugs and knock out the universal joint knuckle pin. Pull out the universal joint assembly. Pull the drive shaft out through the bottom of the drive shaft housing and set it aside. found in most of the model T vendor catalogs. Remove the drive shaft castle nut and press off the pinion gear. Remove the drive shaft pinion key. Pull off the roller bearing. It usually needs to be replaced. Press off the drive shaft sleeve (whatever is left of it). Pull the drive shaft thrust bearing collars and ball bearing assembly. Put the drive shaft thrust bearing collars and ball bearing assembly on the drive shaft. can be fit tightly against it. Grease and slide on the new roller bearing. Set the new drive shaft pinion key and gear. Tighten the drive shaft castle nut into place. Press the drive shaft sleeve back up to meet the back of the pinion gear. Replace the roller bearing housing back into place and slide the drive shaft housing back into place. Place the drive shaft on the floor with the universal joint housing on the top. hole is .005 short of the alignment. Drive the universal joint knuckle pin into place and peen both ends to secure it in place. Replace the universal joint housing plugs. Replace the grease cups once the drive shaft is placed back on the car.